"If you're going to quote me, then write this down." I'm on the range early on the first morning of a two-day class with Dave Harrington, and I haven't even finished my coffee yet. I've been to a lot of firearms classes. In some I've nearly filled a looseleaf folder with notes. At a class last year, a buddy and I not only filled a folder each and had to start on a second one but were still jotting notes on the drive back. Not so with Dave Harrington. My notebook has three pages of the class, with the first one being the details we'd need to know in case of a medical emergency. Lest you take that as a comment on the safety of his class, I've been running into more and more classes where the medical briefing is the start of the class. For Dave Harrington it is simply part of the reality of living in the world. Guns are for shooting bad people. Sometimes the result is that good people get shot by bad people. You'd better know the location of the closest hospital beforehand and not be trying to do an internet search on your Blackberry while leaking blood. Dave comes to firearms instruction from real-world experience. He spent 23 years in the U.S. Army, 16 of them in Special Forces. Judging from his presentation, none of those years was spent on a classic firearms competition range. Do not think from that description that he is a poor shot or poor instructor. Far from it. While most of the time I was thinking to myself "I can do that," Dave is quite a skilled shooter and will perform shooting tasks that you will be hard-pressed to equal. He's a "been there, done that" kind of guy. No, the difference you'll get with Dave Harrington is that he's not at all interested in winning contests, unless the contest is to see who goes home at night, the good guy or the bad guy. As a consequence, you should not go to a Dave Harrington class expecting to learn the fine points of trigger control and how to analyze just what your finger is doing. Nor focus on this grip versus that, or this stance versus that. You aren't going to learn how to tear down, analyze and game out an IPSC or IDPA stage. You won't spend time discussing speed differences of various holsters. What you will be doing is learning how to shoot a firearm in such a way as to increase your chances of being the guy who survives. From my observation Dave is the kind of guy who learns by doing. Some learn by reading, others by watching, but most learn by doing. So Dave has you doing what you need to know. You won't be working on shooting itty-bitty groups in a Dave Harrington class. It always bears repeating: If you're going to take a class, bring a reliable gun. You should have yours de-bugged before arriving. Otherwise you'll be holding back the class as you struggle to catch up. Be familiar with whatever gun you bring (I arrived with a 1911) and bring a spare. Once we'd shot a few groups to make sure our handguns were sighted in (and I'm sure to let Dave see if someone was in over his head), we did a variant of the "step-back" drill. Unlike the classic, where you take a step back after each successful hit, Dave had us jumping back in 25-yard increments. I was quite glad to have my Wilson CQB with me, and to have spent a lot of time at the club plinking at 100 yards because I was still hitting steel out to 125 yards. After that brief test we were almost always in a lot closer, and most of our shooting was well inside of 25 yards. Some exercises had us starting arm's length from the targets. 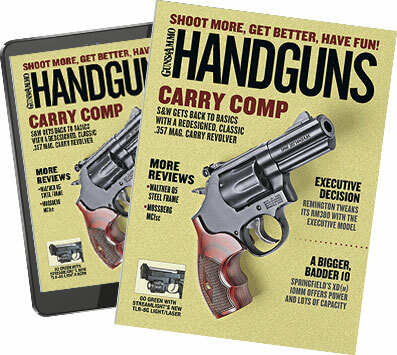 In a Dave Harrington class, you'll work from the holster. Have a sturdy, comfortable holster you can wear all day long. You'll do lots of shooting, so bring lots of ammo. And to avoid downtime, bring all your reliable magazines. Once the preliminaries are out of the way, and Dave has a handle on the skill level of the class, he jumps right in. Shooting while in close proximity to others is not something you'll encounter in controlled conditions like a match. Shooting and moving? Of course. But not just moving away from the target. You'll learn how to move in all directions, while shooting with two hands or one, right or left. The real world doesn't always present you with a neat, clean movement pattern. While match designers go to great lengths to make sure things aren't too difficult, Dave makes it more so. How about moving from left to right across the range, walking backwards, shooting one-handed? No match organizer would have you do that. My bet is that sometime in the past--in some grimy third-world hellhole--Dave had to do just that, because this wasn't even the hardest thing he had us doing. Why bring lots of ammo? Because Dave is not a "controlled pair" kind of guy. I think it came from more of that "travel to interesting places" part of his job in the Army. As long as you are engaged with the target and you're hitting, he wants you hammering the steel or cardboard. If you're missing, you're shooting too fast, and Dave will tell you so. You can count on lots of verbal, public feedback on your efforts. Be big boys and big girls and learn from it. One aspect of modern gunfighting overlooked or ignored by many is that the world is often a crowded place. In a match it will be you, the targets and the range officer with the timer. In a Dave Harrington class, you'd better get used to shooting while standing close to other people. And having them shoot while you're standing close by. In a Dave Harrington class, get used to shooting on the move. And shooting weak-handed. You'll be doing a lot of it. It's all fine and good to learn the basics while standing on a firing line spaced two arms' lengths apart. But in the real world you may have to push someone out of the way to shoot. You'd best get used to shooting while someone is next to you, even leaning on you. We shot moving, we shot while moving around or past others. We even cleared malfunctions while on the move, because that, again, is what you do in real life. While he is not one to fuss over details and has little truck with all the classic drills, Dave recognizes that not everyone is going to be comfortable with his way of doing things. He's up-front about it. If you aren't comfortable with something the class is about to do, step out. No one will think any less of you because you recognize that you can't do it or aren't comfortable trying. No fancy gear, no Powerpoint displays, just a guy who knows how to shoot getting you to shoot and learn from your efforts. When I signed up for the class, I'd heard all sorts of rumors. As is the usual case, the rumors came from those who had not been to a class. No, you aren't going to be leaning on a target as a "no-shoot" while your shooting partner shoots. But you will be a step of two forward of the shooting line (and off to the side at a sharp angle) while someone shoots. If you think the angle isn't great enough, step out. As firearms are effective in poking holes in people, and Dave comes from the real world, do not expect sugar-coated corrections. If you screw up you're expected to "cowboy up" and take the heat: "Joe, what did you just do? Don't you think you owe Bob there an apology for your mistake?" The first day we ended with some night shooting--as in far from town with just starlight dark. First we tried to hit the steel with the light available to us. I learned that while my eyesight is plenty good enough for nighttime navigation, my vision and my sights don't play well together at night. I'm a good shot, but while I was missing on a regular basis, Dave was merrily plinking away. Which found me once again doing what Dave was working to keep from happening in his classes; he wants you training, not evaluating. While I was thinking about how sucky my night shooting was, and wondering what Dave's night vision will be like in 10 years, I wasn't learning to hit at night. So I stopped, snapped out of it, and got back to learning. The second day was like the first but more intense. More movement, more shooting, more new challenges and a few more apologies required and delivered. Just to add more work to our already struggling brains, Dave had us salting our magazine with dummy rounds so we had induced malfunctions to clear. Just because the gun stops working doesn't mean you should stop moving. In fact, if you do stop moving you'll hear Dave asking you "What is going on? Why did you stop? Clear it and get on with the exercise." Dave does not spend a lot of time discussing the theology of shooting, nor in working on the classic drills, but there is one he does have, named after a friend of his. The Siebel Drill is an extended Bill Drill. Three magazines of six shots each. At 25 yards, you shoot to slide lock, reload, shoot to slide lock, reload and shoot to slide lock in 15 seconds. To be considered a good shot, you'll need all hits. Then repeat at 15 yards in 12 seconds, and seven yards in nine seconds. The idea is to get used to having to deliver a high volume of hits, fast. And to reload when you run out because in the real world you aren't going to count your shots nor do a fancy tactical reload. So how did I do? We all judge ourselves, and we all compete at some level. Some of us are just more open about how much we wish to prevail over our class cohorts. I did all right. As I said, my night-vision shooting is just plain lousy, but now that I know it I can work to improve it. I can hit just fine right- or left-handed, moving in any direction, and I clear malfunctions just fine. That last part is a benefit of being an old fart; I learned to shoot when malfunctions were common. The pistol did fine, too. I shot with the high-mileage Wilson CQB you have been reading about for some years now. I fed it more than 1,000 Wolf 230-grain FMJ steel-cased rounds and had no problems. For a holster I dragged out a Blade Tech dropped-and-offset belt holster. Yes, it is considered by some to be a ladies' holster, but if you had spent the time weightlifting that I have, you'd need a dropped and offset holster too. Dave is different. Dave is intense. If you view a firearm as a gunpowder-burning sporting tool like a golf club, don't bother going to a class. Yes, you'll shoot a lot, but you aren't going to learn the finer points of match shooting. If you have a remedial problem that needs work, such as a flinch, or an eye-dominance problem, don't go to Dave's class assuming that all the shooting is going to magically fix your problem. You need someone else for those. Don't go looking for legal advice in a defensive situation, Dave isn't a lawyer, he's a shooter, and he doesn't even live in your state. Go to Dave for the things he teaches: how to prevail in a fight. Oh, and the quote I mentioned at the beginning of the article? "Look at things as they are." Sounds like a pretty good way to run a class, or your life, to me. For info on Dave Harrington's classes, call 813-434-6126.